Here in this post we discuss on the definition of lever (what is lever in Physics), types of lever, Mechanical Advantage of levers with its equation or formula, the Effort arm, Load arm for different types of lever and equilibrium of lever. A lever is a simple machine which is basically a rigid rod which can rotate on a point on itself. That point or pivot is called Fulcrum (F). 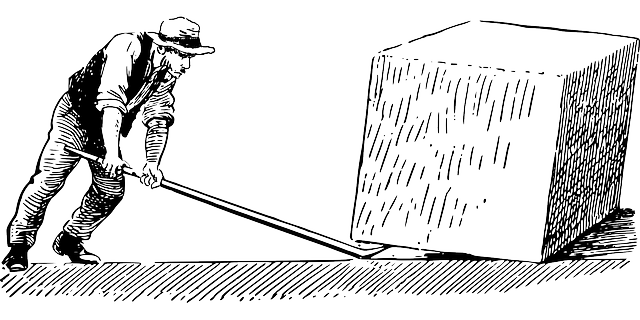 A lever is used to lift a load (L) by applying a force or effort (E). On the basis of the location of fulcrum, load and effort, the lever is divided into 3 types. Class I (Fulcrum in the middle) – example: seesaw where the pivot is in the middle. Class II (Load in the middle) – example: nutcracker where the nut (load here) is in the middle. Class III (Effort in the middle) – example: tweezers where effort is applied in the middle. A lever provides leverage to its users by amplifying the applied force or by providing comfort or convenience to do some specific activities. Mechanical Advantage is the amplification factor of a lever. It’s the ratio of Load and Effort. In balanced or equilibrium of a lever, the following condition is satisfied. that means, another expression of Mechanical Advantage is obtained here. i.e. from equation (c) above, we get 2 equations. So either of these 2 equations can help us to get us the value of the Mechanical Advantage of a lever. So its clear that to leverage a lever and get mechanical advantage value more than 1, EA (Effort Arm) has to be more than LA (Load Arm). This means the load should be nearer to the fulcrum (to have a smaller Load Arm) and the Effort should be applied farther from the fulcrum (to make the Effort Arm larger). For class I and II, we can get mechanical advantage more than 1 by following the above said condition. Now remember that, Mech Advantage = Load/effort. In class III lever Mechanical Advantage can never be equal or more than 1. Can you say why? Here is the answer. In class III , effort is in between the fulcrum and load. So load arm basically takes up the entire length of the lever, starting from load at one end to the fulcrum at the opposite end. While effort being in the middle of the fulcrum and load, effort arm is just a part of the entire lever length. Naturally, load arm(LA) is always bigger than the effort arm(EA) for class III lever. As Mech Advantage is the ratio of EA and LA, so for class III (where LA>>EA) Mech advantage is always less than 1. In Spite of that class III lever is used in specific conditions where more effort is applied to lift much lighter load but with greater ‘comfort’.